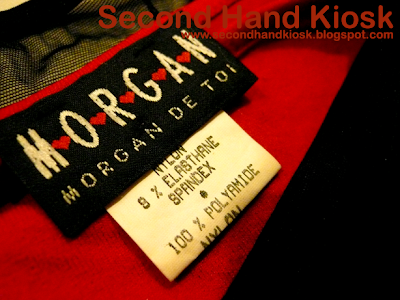 As promised, here are some of the wonderful pre-loved clothes that we have in hand. We'll upload bit by bit as we've noticed customers don't really browse our old posts by categories. They only view what's available on the first page. ;) So yea, if you're reading this, hey, there's plenty more over the next few pages. We don't preview like 20 posts on per page so that our customers don't have to wait long to load our pages or get a lag. So enough talking, browse down and have a happy shopping! If you have any inquiries on the items, please feel free to email us. That's right! Authentic Morgan De Toi! Fits any girl with syle! 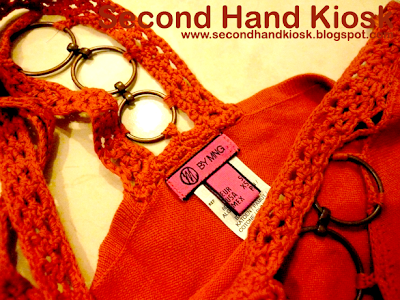 Fits an S to a small M. Pair it up with your jeans for that casual chic. Very good condition. Item has been washed hence crease and wrinkles. MNG body hugging tee with beads and sequins graphic at the front. 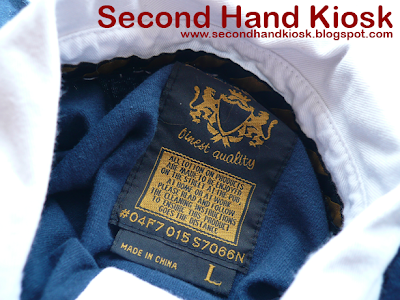 Fits an S to a small M, item is in a very good condition. 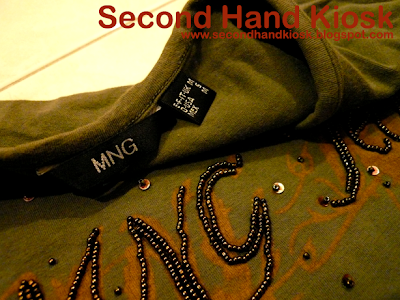 MNG decorative singlet in very good condition. 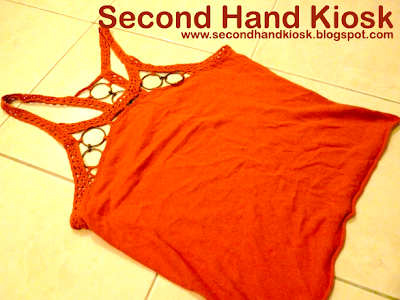 Fits an S to a small M.
MNG decorative singlet in top condition! Fits an S to a small M.
Please take note. Because we understand the importance of hygiene, we make sure that all clothes and accessories are cleaned and washed before we send them out; for the benefit of our customers. We are just like you, we wouldn't want our clothes to be smelled like old books, or perspiration or body odour when delivered to our doorstep! We'll send them for a good spin at the laundrette before sending them out to you. We're sure you want your clothes to smell nice! Baubles of shiny bronze and speckled silver ornates this very exquisite piece. Never been used and has been kept proper in top condition. A beautiful piece indeed. 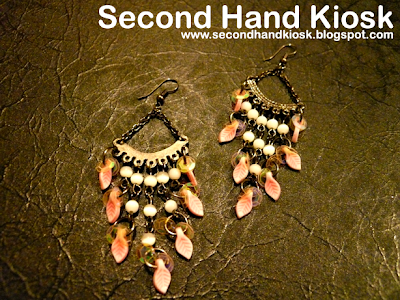 A pair of fashion earrings with pink leaves and white cat eyes beadings. In perfect condition as it was never used before. Hoop earrings for that greek inspired look. Top condition, used only once or twice. Executive buttoned on shorts. Recently purchased and only worn twice. In very good condition. Fits S and small M. Email us for measurements. 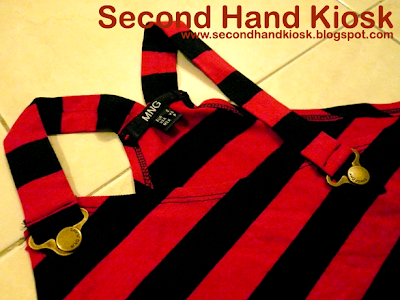 Toki doki inspired blouse, a lovely blouse to be paired up with a fashion belt. Top condition as the previous owner only worn it once. Fits S to a small L. Email us for measurements. 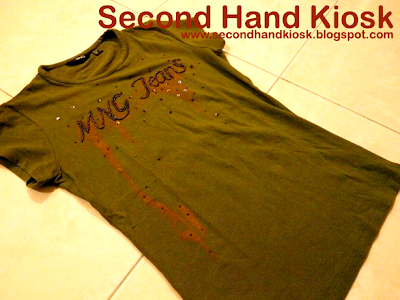 Rugged hipster tee, worn only twice and in top condition. Can be paired up with a fashion belt or wear it as is. 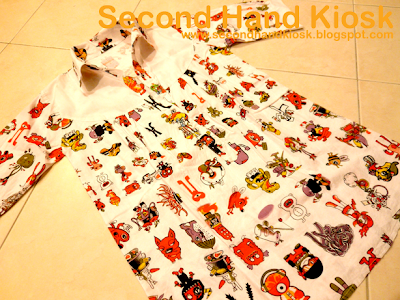 Stretchable cotton material, fits S to small M. Email us for measurements. 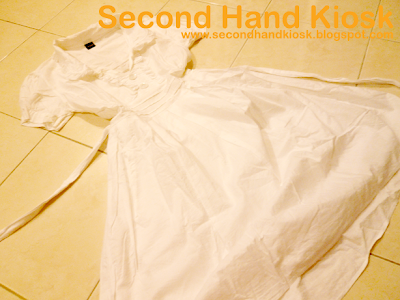 Cute white cotton summer dress, smocked and ribboned at the back to fit S to a small M. Never been used before. Email us for measurements. 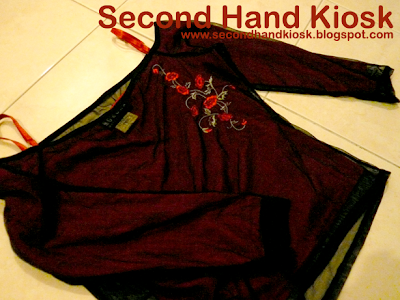 RM40.00 The Spring Sale for RM15! 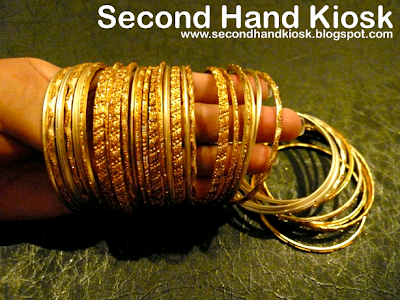 A whole set of sparkly textures bangles with shiny dust. Wanted to pair up with my saree but I didn't have the chance to wear it cos my saree is a goner now after I've moved to my new apartment. So... selling this beauty away then... :( Got them for RM20. 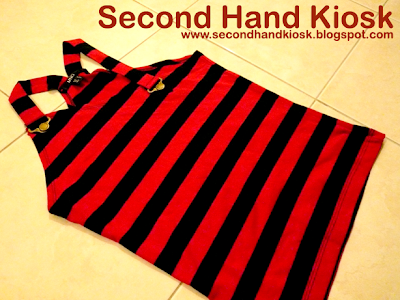 RM20.00 "The Spring Sale for RM5! 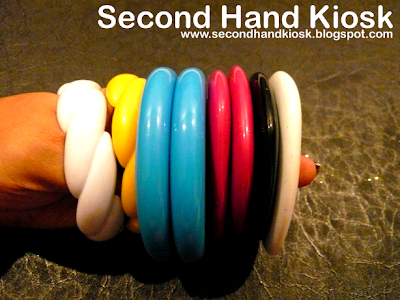 A bunch of plastic bangles my mom hand-me-down few years ago. Some of them were really from the 80's, some of them were from Topshop. 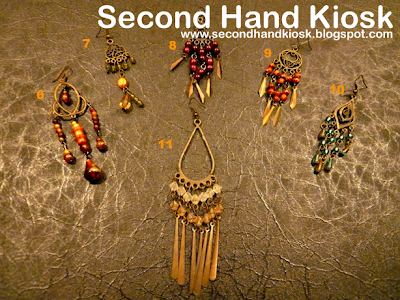 For this particular post, we would like to present you a variety of fashion earrings just for you. 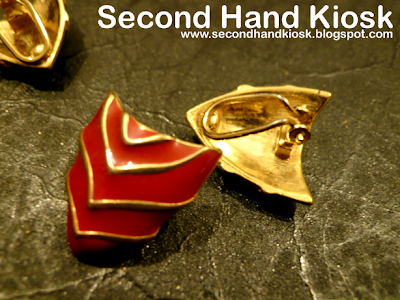 Note that these earrings have been kept for 1-3 years in the utmost perfect condition. How? She stores them nicely in her jewelry box and did not even once use it at all! 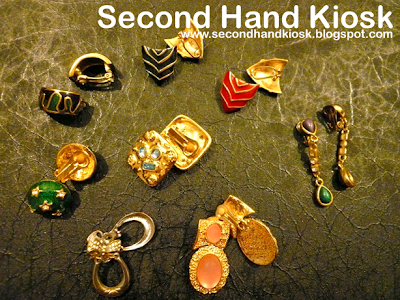 A earring collector she is, we assure you the condition of these items are as real as we preach. Top condition! Reason behind her selling these babies away? :P She's taken a new loving for real jewelries instead. 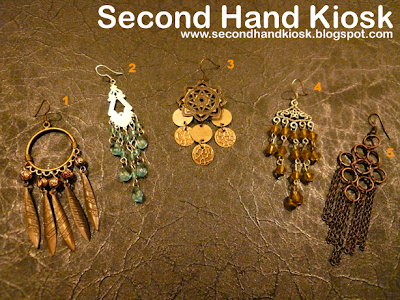 A mix variety of fashion earrings. Previous owner's picks were quite a beauty as she only picks the finest and rarest off the rack! What's even a steal is, she's never worn any of these at all. Just part of her collection in her jewelry box. What a waste! Coming right up in the next week to come, new and pre-loved plus size clothing for that beautiful voluptuous women out there! We will have to take a while to upload these items as we're still scratching our heads for a photography venue to have real model shots to be done! Now, your house or mine?? 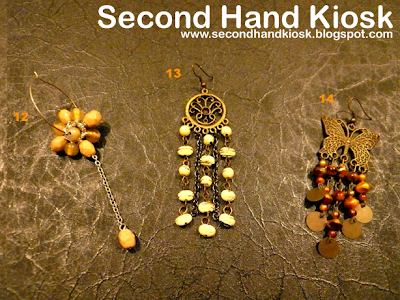 Herewith we present you our vintage earrings aging from 10-16 years of age. 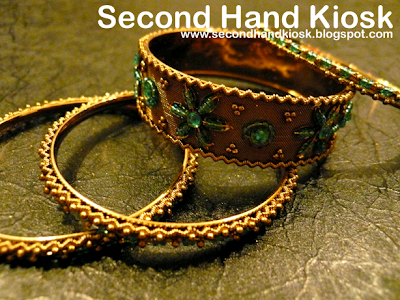 The previous owner has kept her jewelries well and when we say well, it means good enough to be shown to the world. These dazzling items are such a rare beauty that they do really fit for a 60's superstars. Hence, we've named these lovelies under the names of wonderful actresses from the 60's era. The more pricier the item goes, the better condition they are. We are still offering free deliveries for these items BUT only with purchases of two and above. We are only getting a small pinch of profit out of these items so we can't offer you that much bargain and we don't want to sell them at sky high prices just so we can make high profits. We just wanna share the love of these items with you vintage lovers out there. So browse down to take your pick and email us right away!! Happy shopping and hope to hear from you soon! A pair of lovely bow earrings with diamante studs. Age at 13 years old and has been kept so perfectly well by the previous owner. Please note that this item is made of surgical steel. 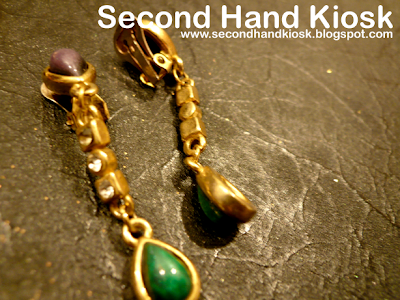 A pair of lovely dangle earrings with purple and green stones. Age at 12 years old and has been kept so perfectly well by the previous owner. Please note that this item is made of surgical steel. 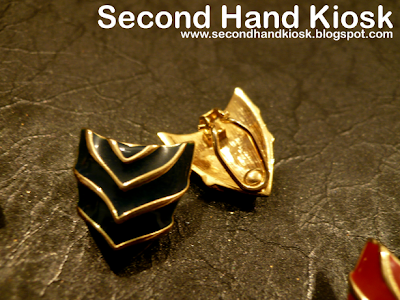 A pair of lovely triangular shaped earrings. Age at 15 years old and has been kept so perfectly well by the previous owner. Please note that this item is made of surgical steel. 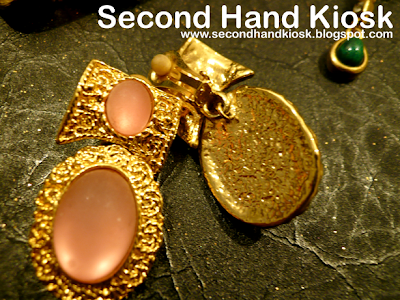 A pair of lovely victorian earrings with sandblasted pink stone. Age at 15 years old and has been kept so perfectly well by the previous owner. Please note that this item is made of surgical steel. A pair of lovely starry diamante earrings with shiny acrylic finishing. Age at 16 years old and has been kept so perfectly well by the previous owner. Please note that this item is made of surgical steel. A pair of lovely geometric earrings with dazzling blue stone. Age at 14 years old and has been kept so perfectly well by the previous owner. Please note that this item is made of surgical steel. 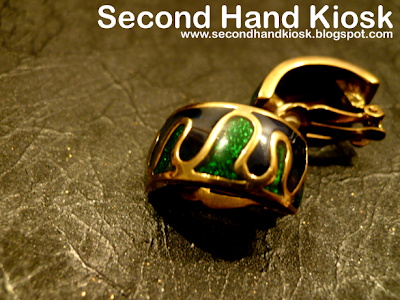 A pair of lovely black earrings with shiny acrylic green finishing. Age at 16 years old and has been kept so perfectly well by the previous owner. Please note that this item is made of surgical steel. Please take note that all crystal accessories featured here on our site at Second Hand Kiosk are real natural stones and are not of glass and plastic beads. Each and every stones found on these sets are all unique with their own character because they are naturally formed during the years in the mountains. A tip from us, always re energize your crystals by placing them in a cup of natural salt water overnight. It will leave your crystals extra shiny and deionized. If you believe in the helps of crystals, this is the perfect moment for you to view the various designs our designer can offer. Please take your time to browse, like they say, the very one that catches your eyes are the one that is made for you. Have a pleasant day. 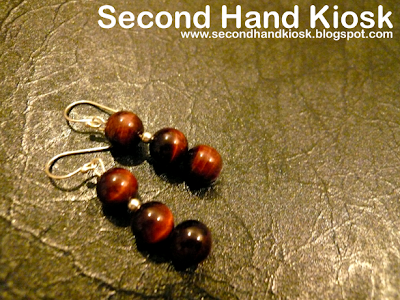 A pair of exquisite tiger eyes earrings. Clear quartz. This new grand item was handmade with love. Comes with 925 sterling silver ear hook, beadings and wirings for that special skin of yours. 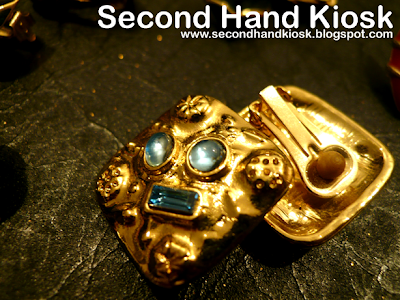 1 and only one for that special you, there's no other replica or same design from the designer. Item comes with drawstring pouch. All crystal beads are genuine and from an A grade source. Item will be Pos Laju-ed for the sake of security and guaranteed delivery. 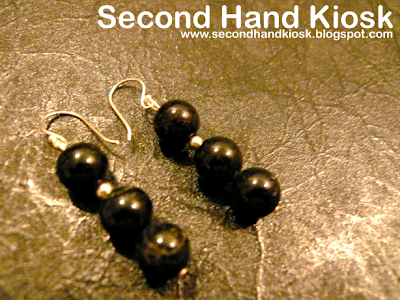 A pair of strong black tourmaline earrings. Clear quartz. This new grand item was handmade with love. Comes with 925 sterling silver ear hook, beadings and wirings for that special skin of yours. 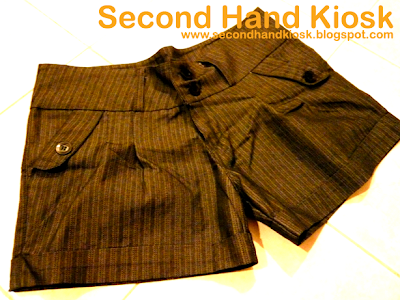 RM35.00 "The Spring Sale for RM20! 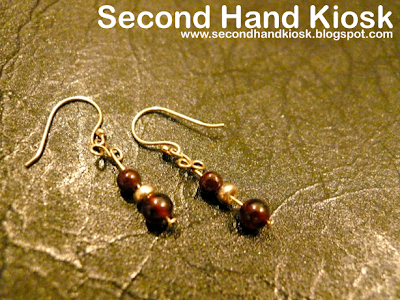 A pair of nice red garnet earrings. Clear quartz. This new grand item was handmade with love. Comes with 925 sterling silver ear hook, beadings and wirings for that special skin of yours. Item comes with drawstring pouch. All crystal beads are genuine and from an B grade source. Item will be Pos Laju-ed for the sake of security and guaranteed delivery. 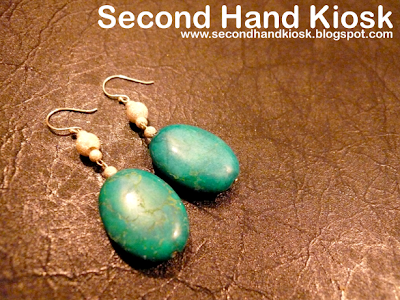 A pair of greenish bluish turqoise earrings. Clear quartz. Comes with 925 sterling silver ear hooks and wirings. All silver beadings are a mixture of 80% 925 sterling silver and 20% nickel for that special skin of yours. This new grand item was handmade with love. Please bear in mind the silver beadings are not 100% pure silver hence, if not taken care properly, there will be a change of color. Item comes with drawstring pouch. All crystal beads are genuine and from a B grade source. Item will be Pos Laju-ed for the sake of security and guaranteed delivery. 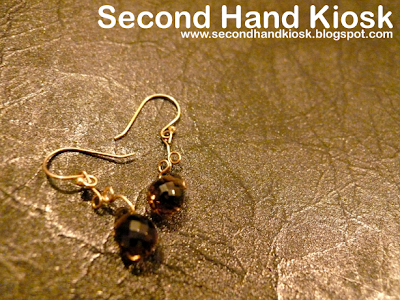 A pair of mystical smokey quartz earrings. Faceted quartz. This new grand item was handmade with love. Comes with 925 sterling silver ear hook and wirings for that special skin of yours. 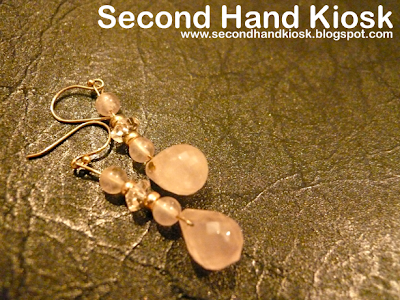 A pair of lovely rose quartz earrings. A mixture of clear and faceted quartz. This new grand item was handmade with love. Comes with 925 sterling silver ear hook, beadings and wirings for that special skin of yours. 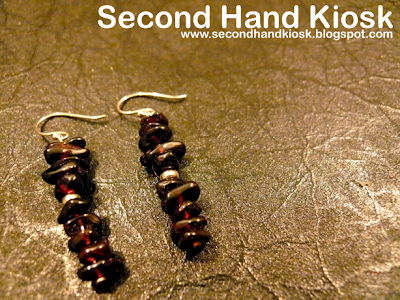 A pair of charming red garnet earrings. Clear quartz. This new grand item was handmade with love. Comes with 925 sterling silver ear hook, beadings and wirings for that special skin of yours. 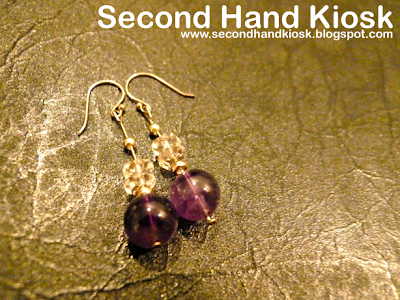 A pair of amethyst and clear quartz earrings. 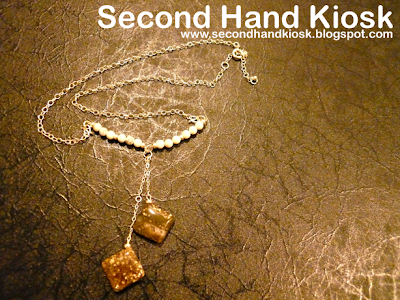 A combination of clear and faceted quartz. This new grand item was handmade with love. Comes with 925 sterling silver ear hook, beadings and wirings for that special skin of yours. 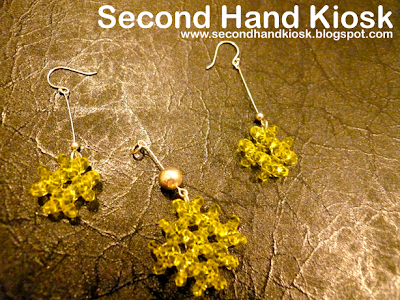 A pair of weaved peridot pendant and earrings. Faceted quartz. This new grand item was handmade with love. Comes with 925 sterling silver ear hook, beadings and wirings for that special skin of yours. 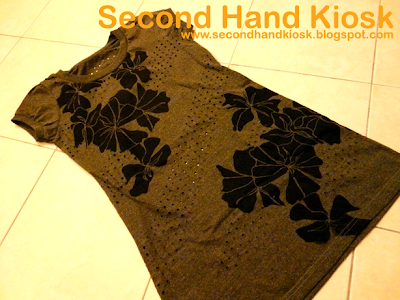 RM55.00 The Spring Sale for RM30! A sweet bunch of tourmaline and howlite stones. A mixture of clear and faceted quartz. This new grand item was handmade with love. A pretty combination of colors for those who love sweet colors in a funky design. 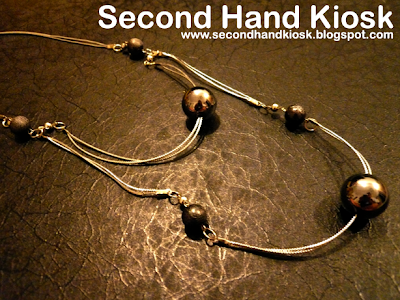 Comes with 925 sterling silver clasp and extension for that special skin of yours. RM60.00 The Spring Sale for RM30! Item comes with drawstring pouch. All crystal beads are genuine and from a B grade source. Item will be Pos Laju-ed for the sake of security and guaranteed delivery. 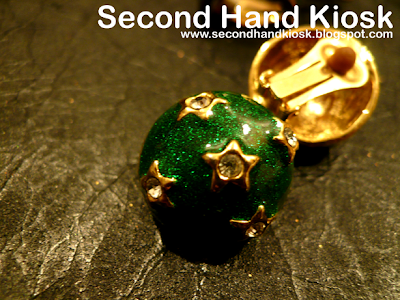 There will be a free crystal pendant adorned with 925 silver with this piece. A unique design of blood stone and howlite mixture. All are clear quartz. This new grand item was handmade with love. A rare find with an exclusive touch of design. 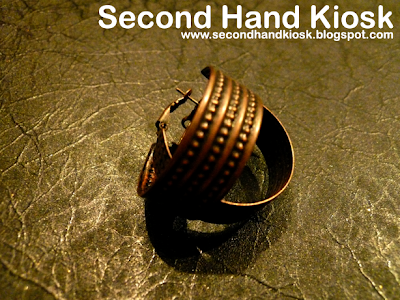 Comes with 925 sterling silver chain, joints and buckle for that special skin of yours. RM90.00 The Spring Sale for RM40! Item comes with drawstring pouch. All crystal beads are genuine and from an A grade source. Item will be Pos Laju-ed for the sake of security and guaranteed delivery. 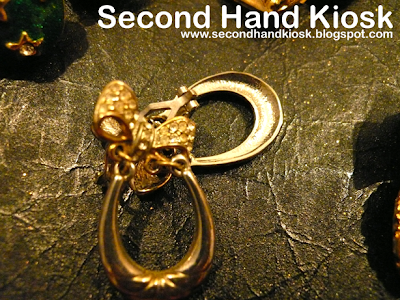 There will be a free crystal pendant adorned with 925 silver with this piece. 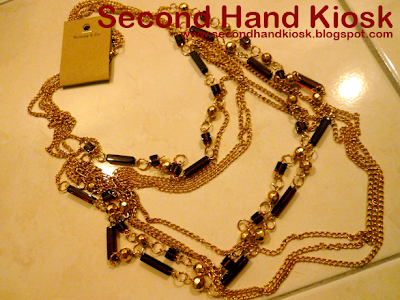 New Ruscoe & Co long layered chain necklace. 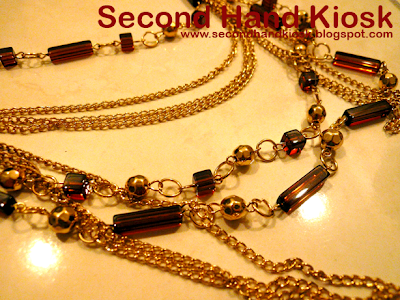 Gold tone chain with Garnet-look-alike stones (reddish brown) and little golden balls. Item was recently purchased less than 2 months ago from a local mall. 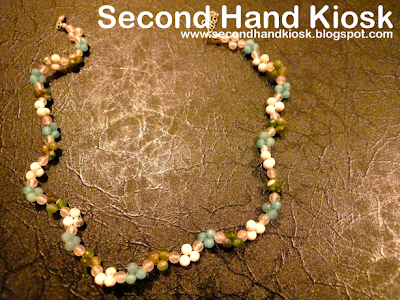 A beauty to be paired up with a little black dress of yours or any attire you want. Item comes with a Ruscoe & Co silvery drawstring pouch. New Cotton On L for men from Australia. 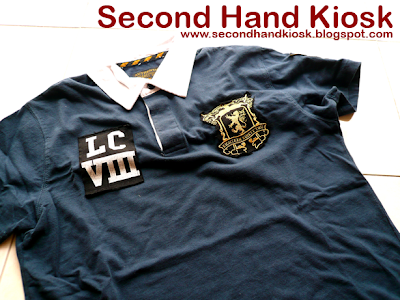 100% Cotton cloth material in blue navy color. New Converse I Love My Chucks XL from Australia. 100% Cotton cloth material in light pastel pink. 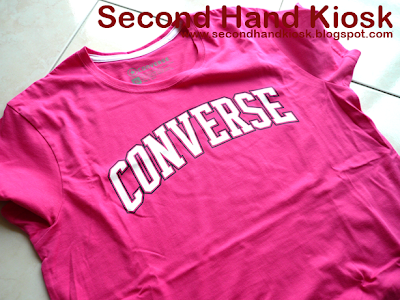 New Converse Pink XL from Australia. 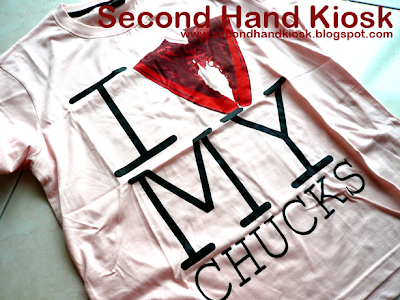 100% Cotton cloth material in fuchsia color. 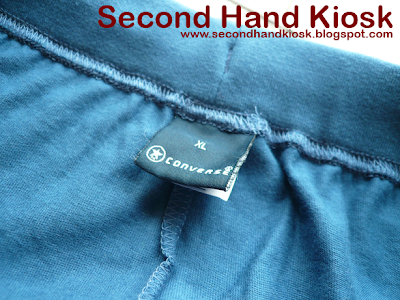 New Converse Blue Gym Shorts XL from Australia. 100% Cotton cloth material in blue. 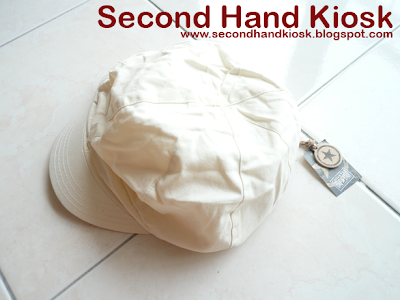 New Converse Luca Cap Ivory from US. 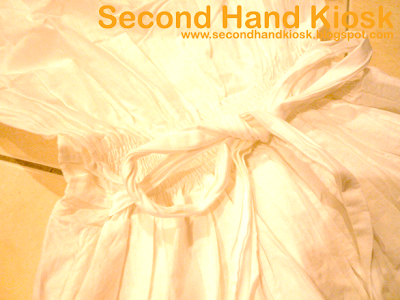 Cotton & Polyester cloth material in ivory.